Yes, you. You are a talented, interesting, vibrant, cherished part of my community of friends and connections. You are gifted. And to celebrate that, throughout the month of December — which is traditionally a month for gift-giving — I am going to give you various gifts through my posts. I won’t tell you now what the gifts will be — wondering what a gift will be is part of the fun. I hope you will enjoy them, and will share them with friends. 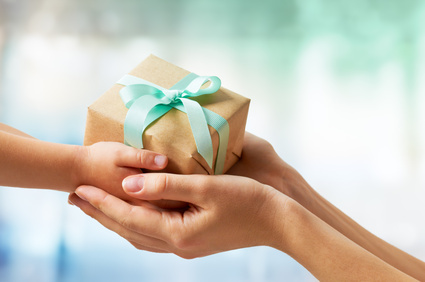 Gifts, whether they are our talents or things we’ve received, are meant to be used and shared. Today I’d like to tell you about a way you can give a gift to others, if you use either Facebook or Twitter. This gift will bring a great deal of joy to its recipients. Giving to others brings a gift of warmth and joy to our own hearts, as well. And speaking of giving books — I want to give you a chance to receive a book that will bring you joy throughout the year. I have an extra copy of Julie Andrews’ Treasury for All Seasons: Poems and Songs to Celebrate the Year. It is in as new condition, and I would love to give it to one of you. Anyone who leaves a comment on any of my blog posts during the month of December will be entered into the giveaway (one entry for each comment). If you already have the book, do leave a comment anyway — if your name is drawn, you will be able to select an alternate book. On January 2nd, I’ll announce the winner. Just for fun, since the Treasury for All Seasons is a book of poems, in the comments today please tell me if you have a favorite poem. One of mine (I have too many favorites to number) is The Lake Isle of Innisfree by William Butler Yeats. And here’s a special gift for you, a post from Renée LaTulippe’s No Water River that includes a video of Renée reciting the poem. What a lovely post and idea for December, Beth! And thank you for sharing my “Lake Isle of Innisfree” post. That poem is so beautiful. Of course it’s impossible to name just one favorite poem, but I’ll post the first one that popped into my head. It is not at all cheery, so be warned. 🙂 I read this first as an undergrad English major in 1986 and it attached itself to me immediately. Beth, what a lovely gesture during this gift giving season. I’d love to have that book. I adore poetry. My favorite book of poetry is called The Music Lover’s Poetry Anthology. One of the best ones in there is “Spring” by Mary Oliver. Since it’s below zero here today, I think I need to read about spring!!!! Also, that hashtag book giveaway sounds terrific! Mary Oliver’s poetry is wonderful! I must find that anthology. It sounds just my style. Thanks, Mary! Ooh, I need to look for that book too. Sounds fabulous! I would love to own the poetry book. My favorite poem is “The Road Not Taken” by Robert Frost. I know that it’s a well-known poem, but it’s always been a favorite of mine. I love that one, too, Kristi. I can picture it in my mind’s eye. Frost was such a great poet. Thank you for sharing! I think I’ve said before that I can listen to Renee recite a grocery list and still be moved. 🙂 What a lovely gesture, Beth! I always gift books to kids. I want to “corrupt” them early. LOL! I have many favorite poems, “The Fog” by Carl Sandburg, “This Is Just To Say” by William Carlos Williams, and “Merry-Go-Around” by Langston Hughes among them. I think I had shared the Penguin Random House campaign, but I should double check. I’m with you in gifting books to kids! And in being moved by anything Renee recites. She has the gift. I love “The Fog” but I’m not familiar with the others. People’s answers to today’s question are a marvelous gift for me, because I’m finding out about more poems! That’s so funny and true Teresa. Renee I really think you should take up the challenge! Thanks for this post. I have passed the word about #Giveabook. What a lovely thing. It’s hard to choose only one poem, but I would probably say my favorite poem is Do Not Go Gentle Into That Good Night by Dylan Thomas. Very powerful. Thanks for a chance to win the book of poems. Very generous of you. What a fabulous poem, Rosi. I love that one, too. Thank you! What a beautiful post and idea, Beth! I have so many “favorites,” depending on the moment of the day, but those that come to mind now are Robert W. Service’s “The Cremation of Sam McGee” and Edgar Allen Poe’s “The Raven.” I get lost in the wordplay and rhythms. What a special post about gift-giving. I love what Random House is doing with #GiveaBook. Will follow through and do this. My husband and I don’t really give gifts to each other and other family members, but instead give to charities — that is our mutual gift. We give all year long, but we usually focus on one favorite charity at Christmas. Thanks, Pat. More of us should follow your example of charity giving instead of gift-giving. Most of us have more than enough “stuff” already.